The unique social and ecological nature of regional watersheds was the focus of a mesmerising presentation by Stephen Lansing at last month’s poptech conference in Iceland. His key point: Bali’s subak water management system is a “coupled social-ecological system”. 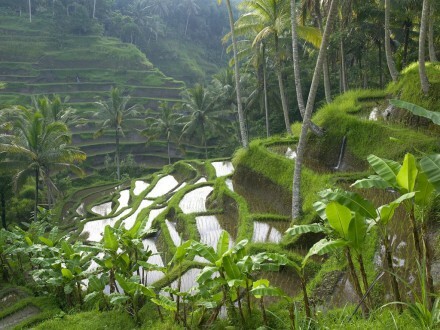 Balinese farmers have been growing rice in terraces since at least the eleventh century. Because the island’s volcanic rock is rich in mineral nutrients, water running off mountains fills the rice paddies to create a kind of aquarium.This system has enabled farmers to grow two crops of rice a year year for centuries. They do this using a unique form of cooperative agriculture that enables farming to flourish despite water scarcity and the constant threat of disease and pests. Rice planting and water allocation is coordinated by subaks; these bring together all of the farmers who share water from a single source – such as a spring, or an irrigation canal. The subaks adjust cropping patterns cooperatively in order to achieve fallow periods over sufficiently large areas to minimize dispersal of pests. Irrigation, in this context, is not just a matter of delivering water to a plant’s roots. The rice terraces are hydrologically connected to each other, so the farmers have had to solve a complex coordination problem: who gets to use how much water, when, and how. A complex, ‘pulsed’ artificial ecosystem has evolved over generations in which the allocation of water is adjudicated by a priest in a water temple. The arrangement is a dynamic one; cooperation is continuous among hundreds of farmers whose relationships span entire watersheds. “There is a complex adaptive systems explanation for water temples” Lansing explains, “but also a complex cultural one”. 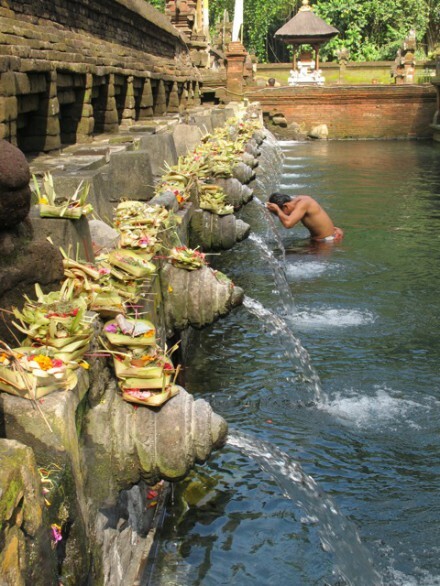 (Lansing has been studying irrigated rice agriculture in Bali for 40 years, but is also is associated with the Santa Fe Institute where his interests include ‘ecological anthropology’).”The temples are more than just a kind of mathematical device”, he explains; “a great deal of attention is devoted to symbolic ritual activities such as food offerings, prayers to deities, and elaborate pilgrimages. Rituals, says Lansing, serve the regulatory function of feedback; they embody the interdependency of upstream-downstream relationships, and codify tradeoffs between water sharing and pest control that are the result a very long term trial-and-error process. Rituals materialise ideas accumulated over centuries. In the 1970s, this system was badly disrupted. Indonesia, which was struggling to meet the costs of importing rice to feeds its growing population, perceived a need to improve agricultural productivity. The country turned for help to The Asian Development Bank, an early funder of the Green Revolution. Government subsidies for the use of fertilizers and pesticides were introduced. Farmers were made to switch to ‘miracle’ rice varieties, and were also pressured to disregard the traditional irrigation schedules of neighboring paddies and plant rice as frequently as possible. The experiment almost destroyed subak system within a decade. After a brief increase in productivity, crops dwindled drastically as water shortages and infestation by vermin took hold. Miracle rice begat miracle pests as a plague of plant-hoppers devastated crops. By 1974, field workers in Bali were reporting “chaos in water scheduling” and an “explosions of rice pests”. In 1984, Lansing told the Asian Development Bank that these problems were linked to disruption of the traditional system of water management, and that their high technology and bureaucratic solutions had proved to be counterproductive. ADB officials remained sceptical until Lansing, working with ecologist Jim Kremer, built a computer model. The model, which simulated different cooperation strategies among farmers over long time periods, confirmed that coordination – from farmer level up to the level of the watershed – was best made at the temple level. Eventually, Indonesia’s officials became such converts to the water temple system that now, thirty years later, Subak has been accredited by Unesco as a ‘cultural landscape’ of world importance. “Subak brings together the realms of the spirit, the human world and nature” states the Unesco declaration; “This system of democratic and egalitarian farming practices has enabled the Balinese to become the most prolific rice growers in the archipelago, despite the challenge of supporting a dense population”. Accreditation by Unesco will bring its own challenges. High among these is too much tourism. About 1,000 hectares of Bali’s paddy fields are already being converted into egregious spa complexes each year; with world heritage status comes a risk that this unique agro-ecological landscape will be replaced by a less sustainable system: the intensive cropping of large white migratory mammals. In Bali, the ADB’s engineering approach nearly destroyed a thousand year old system that worked. For the time being, disaster has been averted – but in the world at large, a top-down mindset continues to dominate development. The Alliance for a Green Revolution in Africa (AGRA), for example, which was founded by the Bill & Melinda Gates and the Rockefeller Foundation, speaks constantly in the productivist language of engineering. Its programs are all about “boosting productivity”, “rapid growth”, “delivery models” and “the creative forces of globalisation”. By treating nature as if it were a machine to be speeded up, AGRA modifies the tactics but does not challenge the thinking of the Green Revolution.This approach can only be destructive in the long run. Nature is not a machine. It is a complex of living systems whose cycles operate at different speeds according to a multitude of different time scales. Natural time does not progress in straight lines, either; it moves in cycles that are shaped by the unique qualities of different locations. People who have lived in a place for generations, like Bali’s rice growers, understand this. The “creative forces of globalization” cannot possibly do so. There is no place in a world of rapid growth and “boosting productivity” for the the complex temporality of plants, animals, and ecosystems. On the contrary: The industrial system has decoupled the rhythms of nature from the metronomic pulse of production precisely in order to speed the latter up. One result of this speeding up was the depletion of soils in Africa by the first Green Revolution. AGRA’s solution? “Some application of fertilizers” combined with soil fertility “management.” Hmmm. The Balinese, explains Stephen Lansing, have very different ideas. They think about time in terms of the multiple, concurrent and interlocking cycles found in nature. Their master calendar plots the rice cycle; it contains 210 days, the growth cycle of Balinese rice. A market ‘week’, which is three days long, has not changed for a thousand years. Lansing, with a sense of wonder, now understands that these ancient but living conceptions of time are what today’s ecologists think about, too. If the rest of us are to work with nature, and not against it, we must subjugate machine time to organic, ecological, and even geological, tempos. Scientific knowledge is not an alternative to indigenous knowledge – we need both – but not in a hieracrchy with science on top. Managing environmental resources has to be collaborative, and adaptive. Different ways of knowing are vital if we are to understand and respect the unique assets of each territory. This adjustment will be hard: The natural systems that sustain us move at a slower rhythm than we do. Feedback loops in nature are slower than lightning-fast synapses we’ve built into our machines. Think of soil: without it, we will all starve – but soil formation takes millennia, and can’t be hurried. In connecting with the multiple cycles of nature, Balinese farmers have help: Their music is a form of ecological knowing. According to musicologist Judith Becker in Time and Tune in Java, Gamelan music, like nature, is composed of multiple interlocking cycles. “It perfectly reflects its culture’s organization of time into cycles, subdivisions of cycles, and concentric cycles rotating simultaneously within each other” writes Becker; “order appears if the cycles are integrated well; it doesn’t if they are not well integrated. Music and time are clearly metaphors for one another”. Joanna Macy, as so often, puts it best: “By opening our experience of time in organic, ecological, and even geological terms, and in revitalizing our relationships with other species and other eras, we can allow life to continue on Earth”. And that’s why Bill Gates, and the rest of us, need to listen to Gamelan music more. This entry was posted in development & design, most read. Bookmark the permalink. Post a comment or leave a trackback: Trackback URL.